Dr. 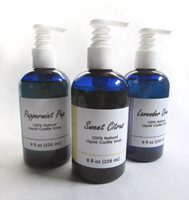 Bubbles handmade, Real Deal True Castile Liquid Soap is truly luxurious. Made only from organic olive oil, it is mild and gentle enough even for babies. You can use this liquid soap for every part of your body including your hair. With lather that is rich and creamy, our Real Deal True Castile liquid soap will leave every millimeter of your body and hair feeling like a baby's behind.